A newly planted sweet potato vine grows with a scented geranium in this full-sun hanging basket. Do you ever buy ornamental sweet potato vines for your hanging baskets or pots? These have become more popular in recent years, and several beautiful varieties with variegated or purple leaves have come on the market. I planted a few in our large planters on the front patio a few years ago. They looked gorgeous… until the deer snuck into the garden and had one for a midnight snack! 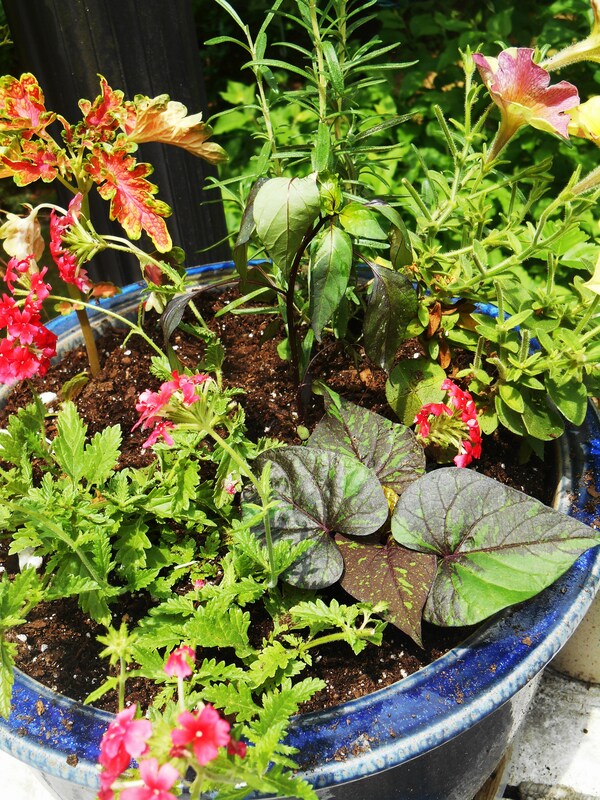 A variegated sweet potato vine grows in a mixed container with summer annuals (2015). But no worries, these are prolific growers. The vine grew back in just a few weeks. That’s not to say that it didn’t get grazed again from time to time! As it turns out, sweet potato vines are both delicious and highly nutritious! We know that sweet potato tubers are packed with vitamins and minerals. Turns out, their leaves are, as well! The deer were onto something! But the real surprise came in the fall, when I lifted the summer annuals out of their pots to re-plant hardy ornamentals for winter. My ‘ornamental’ sweet potato vines had quietly gone about their business of making huge, lovely tubers! Their tuberous roots are edible, no matter how fancy the leaves might be. I never bought any sweet potato vines at the garden center this spring. But I noticed a sweet potato in our pantry sprouting vines a few weeks ago. I moved it into a shallow tray of potting soil, in the light, and let those vines continue to grow. Like you, I’ve wrestled a sweet potato suspended in a Mason jar of water a time or two. They are very entertaining for the little ones, who love to watch how fast they grow. This works great for a while, until the potato inevitably begins to rot. But placing a potato in a pot of moist sand or soil is a more reliable way to encourage it to sprout. 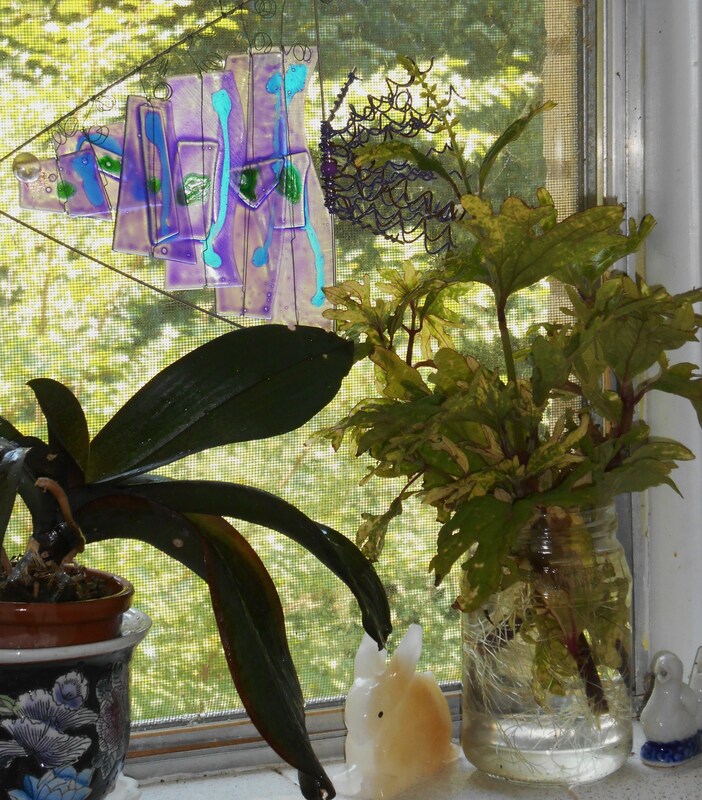 The long, sinuous vines quickly fill a window sill with beautiful heart shaped leaves. If you’ve contemplated their leaves, you probably noticed how much the leaves and vines remind you of morning glory vines. Turns out, the plants are related! A sweet potato’s botanical name is Ipomoea batatas. Most of the morning glory, moonflower, or bindweed species belong to the genus Ipomoea. 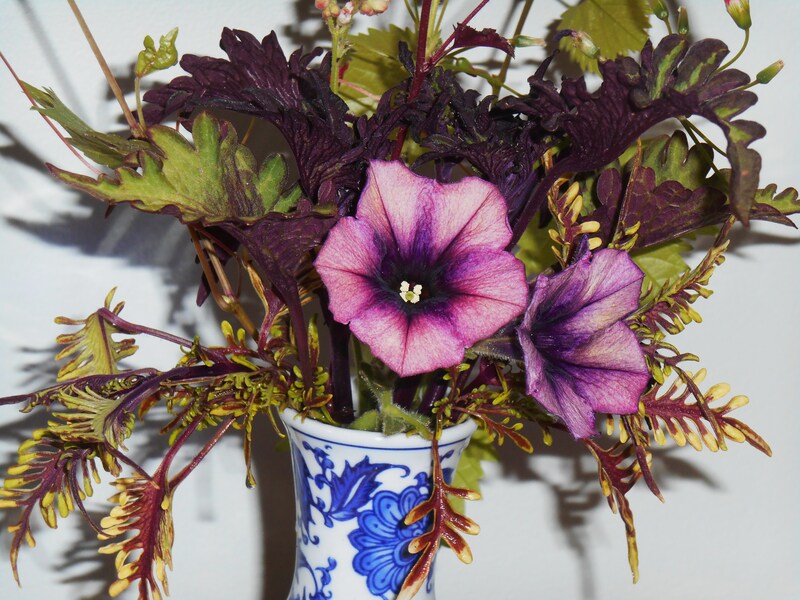 If your ornamental sweet potato vines have bloomed, you probably noticed that their flower is very like a morning glory. There are over 500 species in the Ipomoea genus! I decided to let my sprouting potato grow in order to transplant those beautiful vines into hanging baskets on our deck. It is probably a little late in the season to plant with potatoes in mind, but I knew we could enjoy the vines. I waited for a wet and cloudy day, and then simply twisted and pulled each stem away from the potato, and planted it into a little drill made into the wet soil in the basket. What could be easier than poking one’s finger into the dirt, planting the vine, and firming it up? That is all there is to it! Sweet potato vines serve as a host plants and nectar plants for some species of butterflies and moths. If you don’t have a wet and cloudy day in the forecast, some gardeners twist the vines from the potato and then leave the vines in a glass of water for a week while roots begin to grow, before transplanting the vine into a pot, bed or basket. This is the way all vegetable gardeners start off their sweet potato patch each spring! Some may mail-order their slips, or starter vines, to procure a particular variety of sweet potato. If you’re not choosy, then buy your starter potato at the grocery store and start your own slips. Sweet potatoes, also known as ‘yams,’ want a light, sandy, quick draining soil in the garden; if you’re growing them for a fall harvest of sweet potatoes. If your main interest is their beautiful vines, you’ll plant into any good potting soil already in your containers. To make a long story longer, I bought a few fresh sweet potatoes at the farmer’s market a couple of weeks ago. I’d left them in their plastic bag on the kitchen counter. I hadn’t gotten around to cooking them, when I noticed their little purple leafy stems pushing against the bag. It doesn’t take long this time of year for things to get growing, does it? Since I have plenty of vines myself now, I’m sending these newbies to my daughter. It was humid enough in the plastic bag that these vines have even started sprouting roots along the base of their shoots! I’ve wrapped the bits of potato I trimmed away, still supporting their shoots, in a moist towel and sealed them into a zip-lock to prepare them for their journey through the US Mail. She can twist each stem loose and plant it in a pot. And, I finally cooked those potatoes today! If you live in an area where you don’t have the 4-6 months of warm weather required to raise sweet potatoes in your garden, you might consider growing them in pots for their leaves. The leaves can be steamed or sauteed. I bet they would be good dipped in a tempura batter and fried, too! This is a prolific ‘cut and come again’ veggie treat. It is an edible that can be grown in a very small space, even on a windowsill or balcony, by someone who wants a steady supply of fresh greens. For the cost of a single potato, you can fill several pots or baskets with beauty and a delicious crop that will produce indefinitely. The sweet potato is a tender perennial, and so will continue to grow so long as you protect it from frost. 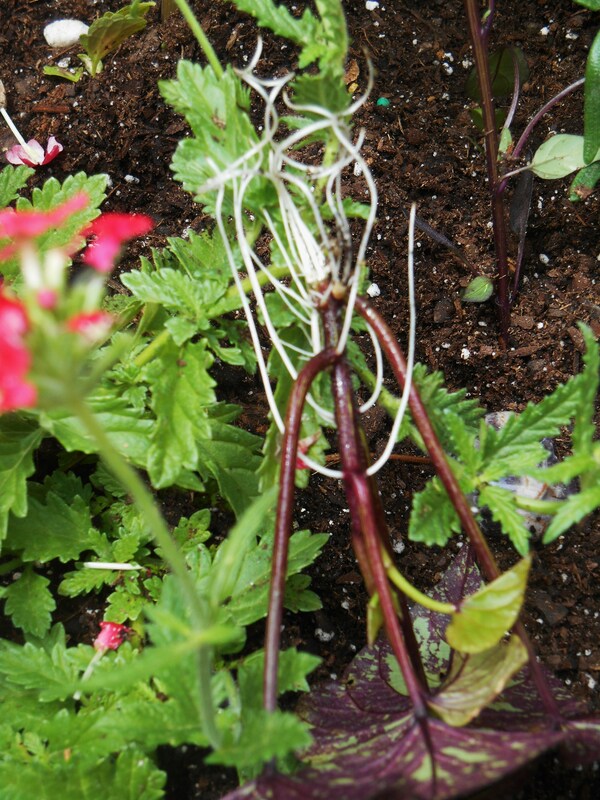 The vining stems will sprout roots at every leaf node, and so stem cuttings will root easily in water or moist soil. Plant vines into window boxes, tubs, or large pots to grow a crop of sweet potatoes on your porch or in your sunroom. We get so accustomed by buying our veggies at the market that we sometimes forget how easily and affordably we can grow our own food. It’s always comforting to have a trick or two tucked up our sleeves, and a ready source of food we grow for ourselves at home. What could be easier than starting a sweet potato vine? Shlumbergera blooming in our living room in February 2015. Christmas or Thanksgiving cactus plants may become another family heirloom. Long lived and easy to care for, this is a quintessential ‘pass along plant’ you may be gifted with during the holidays. Whether someone gives you one in full bloom in a little foil wrapped pot, or a well-meaning aunt insists on sending a cutting home with you, this is the season when many families enjoy a blooming cactus as a part of their holiday. A neighbor gave us this beautiful Christmas cactus covered in buds, last week. I can’t remember a time when my own mother didn’t have a Christmas cactus. Her first one began as a gifted cutting from someone in the extended family. At one time it had grown to a monstrous size, maybe 20″ or more around in a large clay pot. I never gave this ugly duckling house plant much consideration in those years, probably because hers didn’t often bloom. Once you’ve enjoyed the vivid, decidedly odd blooms of a Schlumbergera on a wintery day, you may develop an appetite for these unusual plants just as I have. Their extravagant flowers are meant to attract hummingbirds to pollinate them. I love to have one in full bloom indoors when its snowing outside. The ‘off’ bloom schedule of these beautiful tropical cacti may have something to do with their country and hemisphere of origin. They were originally collected from the mountainous coastal forests of southeastern Brazil, where they grow in bright, humid shade. They may be found growing high up in trees on moss covered branches, or in small pockets of soil in rocky areas at high altitudes. They were in cultivation in Europe by the early 19th Century, where breeders developed new cultivars for the market. They were enjoyed both in homes and in fashionable heated greenhouses. Although a cactus, these plants have no spines to stick you. A succulent, they don’t require a great deal of care. They offer a bulky green presence year round, bursting into abundant vivid bloom between late October and late February each year. Schlumbergera commonly turn up in grocery stores and garden centers blooming in shades of red, pink and purple. Sometimes you may find one with white blooms touched with vivid rose. More rarely, they can be found blooming in shades of salmon, yellow or orange. This is one reason it pays to know how to root a Christmas cactus. Once you find one of the rarer colors, you might want to produce more to share, or for your own collection. Light pink Christmas cactus with a tiny white poinsettia on offer at a local garden center. Another reason is that the stems, which look like flat leaves, can sometimes be a bit fragile. A section may break off while you are moving the plant or while you are moving around the plant. When this happens, it feels nicer to root the broken piece than to discard it. I’ve tried many different ways to root these odd green stems over the years. The stems don’t really like to sit in water, though I’ve seen my mother root them this way. 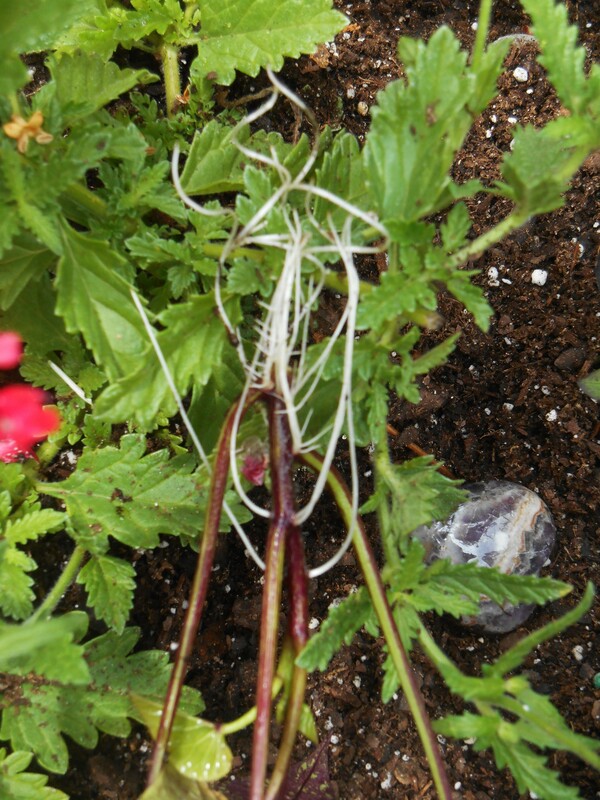 They also don’t root reliably when simply stuck into some potting soil, though this sometimes works OK. If the stars don’t align, or the temperature and humidity aren’t just right, then your efforts may be rewarded with a shriveled or mushy bit of stem with no roots to sustain it. I experimented with a new technique for rooting a Christmas cactus stem in extremely shallow water, on moist rocks. I was understandably excited when I saw a pin on Pinterest a few months ago, offering a novel way to root Schlumbergera. The key to the wet rock method is to understand that Schlumbergera naturally grow in a humid, coastal forest, high up in the mountains. High humidity is the key, along with keeping the stem mostly dry, with only the growing tip in water. 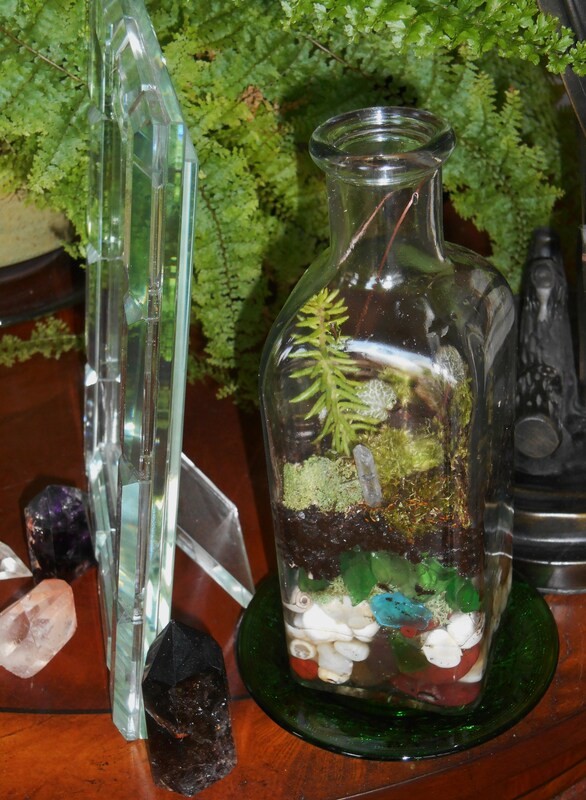 Begin with a glass or small jar, and add a few inches of clean, attractive rocks. 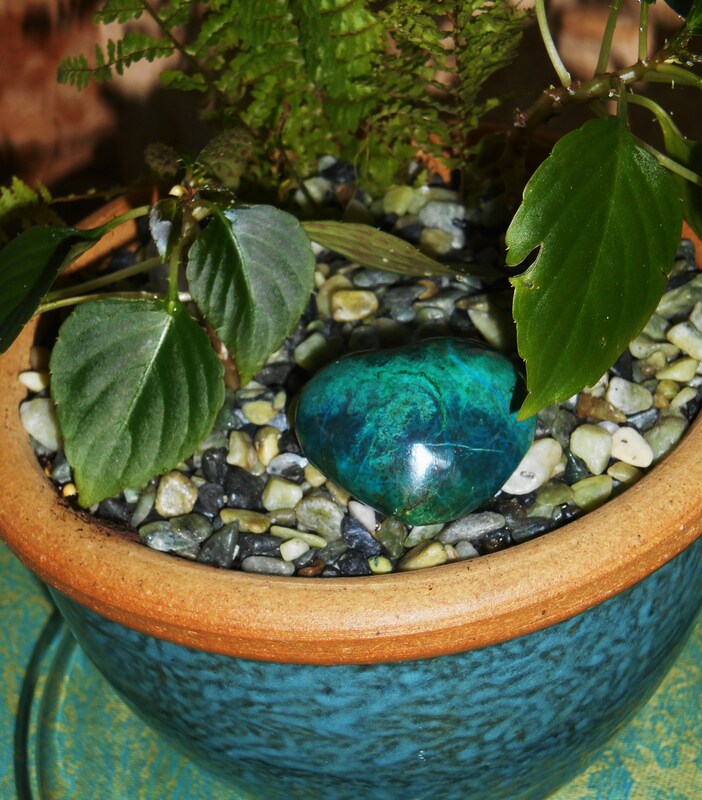 Fill your glass with just enough fresh, cool water, to barely cover most of the rocks. Then add your cuttings so that they rest on the rocks in very shallow water. It works best to ‘twist’ the cutting from the parent plant rather than using scissors to remove it. You will need at least 1 full stem section, though you may take a cutting a few inches long, like this one. If the cutting already has flower buds, they will continue to grow as your cutting roots. Place your container and cuttings into a bright, cool window sill, where the cuttings will get bright light, but minimal direct sunlight. Keep the water replenished every few days, and watch for those roots to grow. 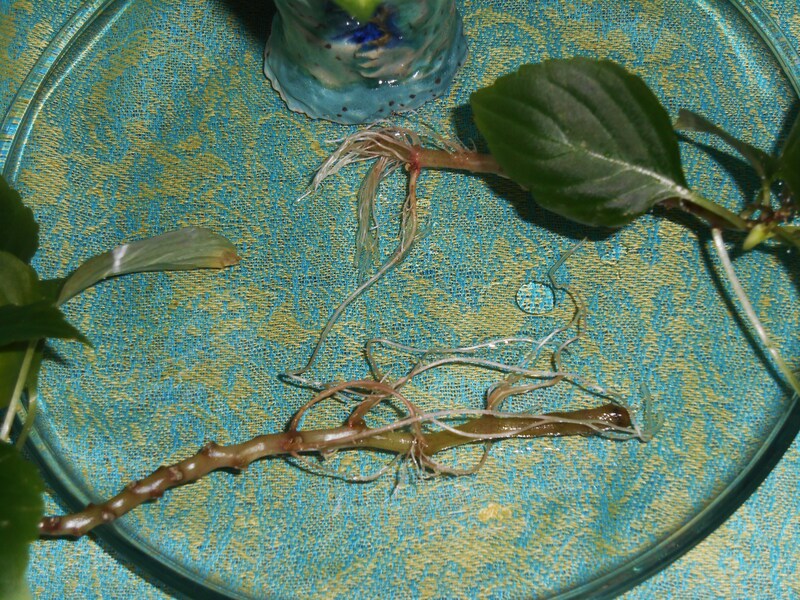 Once the roots are at least 1/4″ long, you can pot up your rooted cutting in a peat based soil mix with a little grit. The soil needs to drain easily. Keep the soil just moist, but never really wet and never bone dry. This cutting is ready to pot up in good quality peat based potting mix. Add a little fine grit to improve drainage. 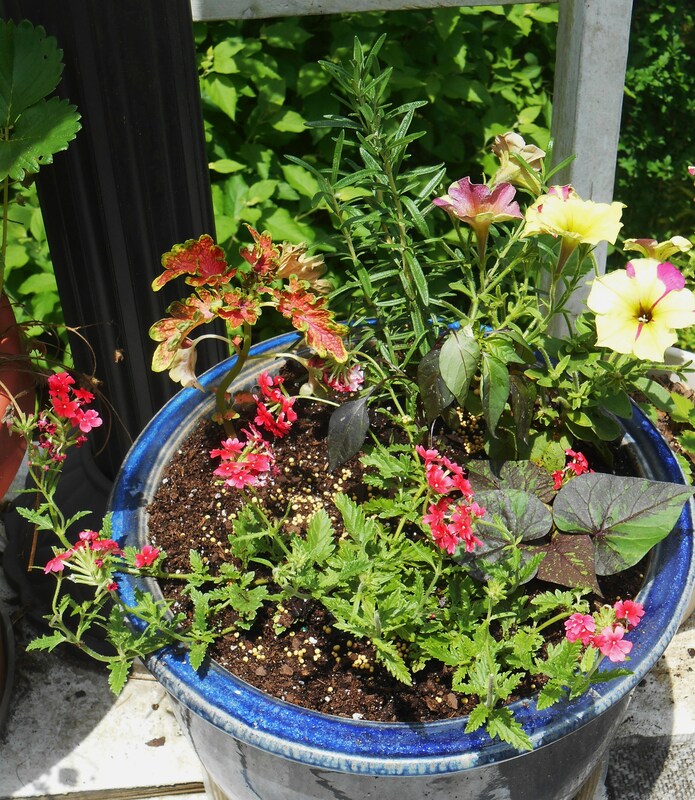 If you plant into a container without drainage holes, be sure to begin with a few inches of gravel in the bottom of the container for drainage. I feed my Christmas cactus monthly, during their season of bloom, with diluted orchid fertilizer; which keeps the buds coming. Mine live near a large window where they get bright light during the daytime, but they also get natural darkness in late afternoon. They like long nights and shorter days during their season of bloom. The long nights help trigger bud formation. Shlumbergera also use more water when they are blooming, and of course thrive in a humid environment. If your home has very dry air in winter, then try grouping them together, and consider setting the pots on trays of pebbles with a bit of standing water in the tray. This cutting rooted in the glass on moist rocks. After a few weeks, I planted it in its own little container to grow on until spring. In our climate, Christmas cactus thrive in bright shade on the deck all summer long. I move them out in late April, once danger of frost has passed. They love our humidity and grow lush with very little attention until time to bring them in ahead of the first fall frosts in late October. By then, they have covered themselves in flower buds. Keep your plants large and lush by adding rooted cuttings to your established pots of Christmas cactus. They like a tight fit for their roots in the pot, but do pot them up every few years and give them some fresh, fertile soil. If your space allows, plant Christmas cactus in hanging planters, or set the pots up on plant stands where their drooping branches and long, pendulous flowers may be admired. I’ve even seen a grouping of Christmas cactus pots arranged on a plant stand with layers of shelves, to give the illusion of a blooming Christmas tree. These odd houseplants are extremely easy and rewarding to grow, once you know a few hacks to make your efforts more successful. 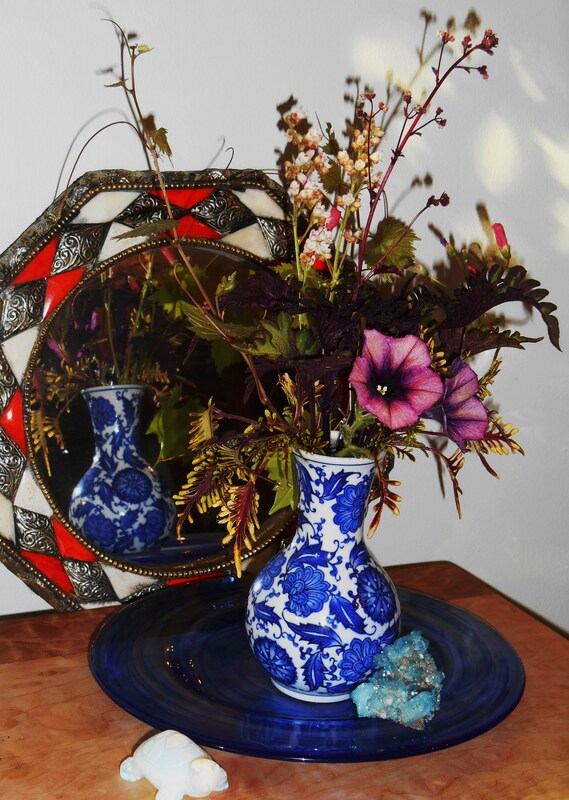 In A Vase On Monday: Good Enough to Eat…. August feels like a very ‘green’ month; especially here in coastal Virginia where we are totally surrounded by green trees, vines, lush green lawns, billowing green Crepe Myrtles and other rampant growth. From Lamas in early August, to Labor Day weekend in early September, our world remains vibrant and green! Early evening, yesterday, from the Colonial Parkway. You can watch some plants literally grow hour to hour and day to day, given enough water. If you ever wondered what it would feel like to live in a hot-house or conservatory, welcome to a Virginia August! This is the time of year when we seek the cool, green shade of large trees and vine covered trellises to help us through the relentless heat. Herbs in our August garden. Our swallowtail butterflies love the chive flowers. This clump remains one of their favorite stops to feed. And so it feels appropriate to cut cool green stems from the garden today. I’ve cut an assortment of herbs for their fragrant leaves. The burgundy basil flowers and white garlic chives serve only as grace notes to the beautifully shaped, textured and frosted leaves. Much of this arrangement is edible. Except for the ivy vines, a little Artemesia and a stem of Coleus; you could brew some lovely herbal tea or garnish a plate from the rest of our vase today. There are two different scented Pelargoniums here, including P. ‘Grey Lady Plymouth’, and African Blue Basil. 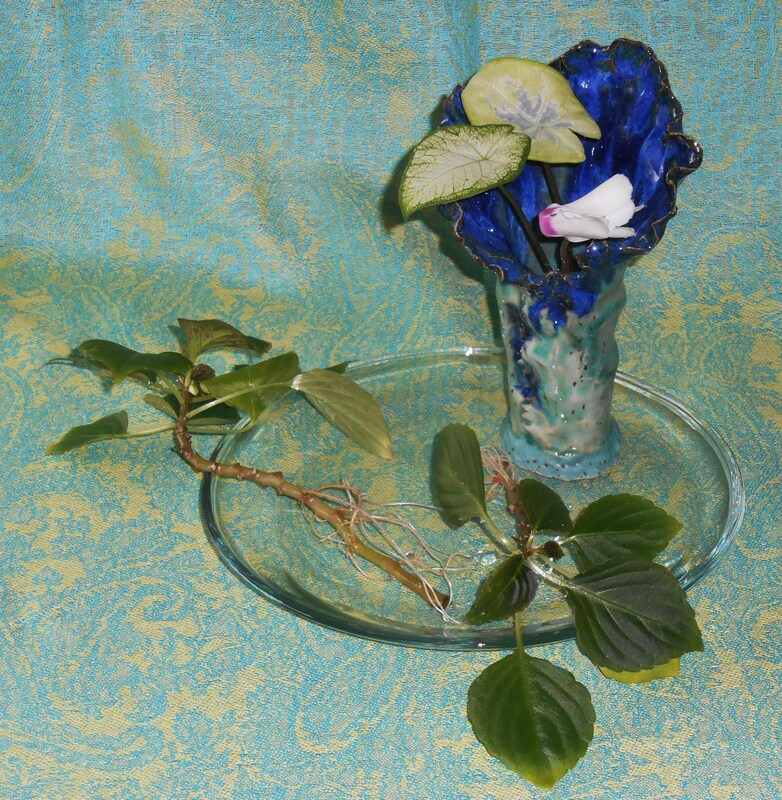 To make this arrangement feel even cooler, it sits in a cobalt blue vase from our local Shelton glass works on a sea-green glass tray. A moonstone frog rests nearby. The vase was made locally by John Shelton of Shelton Glass Works here in Williamsburg. Today’s vase is so fragrant that my partner commented as soon as the stems came into the room. It is a spicy blend of rose scented Geraniums and sharp Basil, with an undertone of garlic from the chive flowers. It makes puts me in the mood to mix up a little ‘Boursin Cheese’ with fresh herbs from the garden, and serve it garnished with a few chive blossoms! Appreciation, always, to Cathy of ‘Rambling In the Garden” for hosting ‘In A Vase On Monday’ each week. I admire the dedication of flower gardeners all over the world who faithfully clip, arrange, and photograph their garden’s bounty each Monday. Cathy is in the pink again today, with some beautiful lilies she has grown this summer. I hope you will click through to Cathy’s post and follow some of the links to enjoy today’s beautiful arrangements. Near Yorktown on the Parkway, just before sunset last night; the inspiration for today’s vase…. The second of the African Rose Mallow shrubs I purchased this season, planted in compost near our bog garden, began the season as a rooted cutting in a 3″ pot. We have been growing a new (to us) variety of Hibiscus this summer known as “African Rose Mallow.” I found a small pot of it in the water garden section at our local Homestead Garden Center in late May, and added it to our new bog garden. There are so many things I like about this small shrub: First, nothing has bothered it all summer. Not a single leaf or twig has been nibbled by deer, rabbit, squirrel, or insect. Its leaves remain pristine. And what gorgeous leaves! 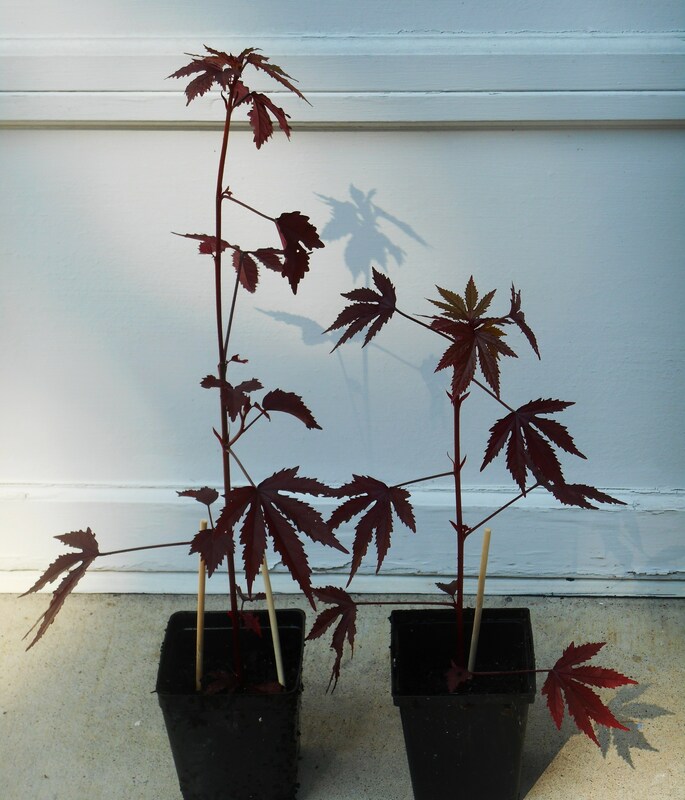 Their delicately cut silhouette reminds me of a Japanese Maple’s leaf. The color has remained a rich, coppery red throughout the summer. Red leaves on bright red stems certainly makes a bright statement in this area where I’m also growing so many chartreuse and purple leaved plants. This African Hibiscus, Hibiscus acetosella, has won my heart over the past three months for its eye-candy appeal and sturdy constitution. It is a fast grower. I’ve repotted the original plant twice, and it is already showing root growth from its drainage hole again. I bought a second plant when I spotted it a few weeks later and planted it directly into compost around the edge of the bog. 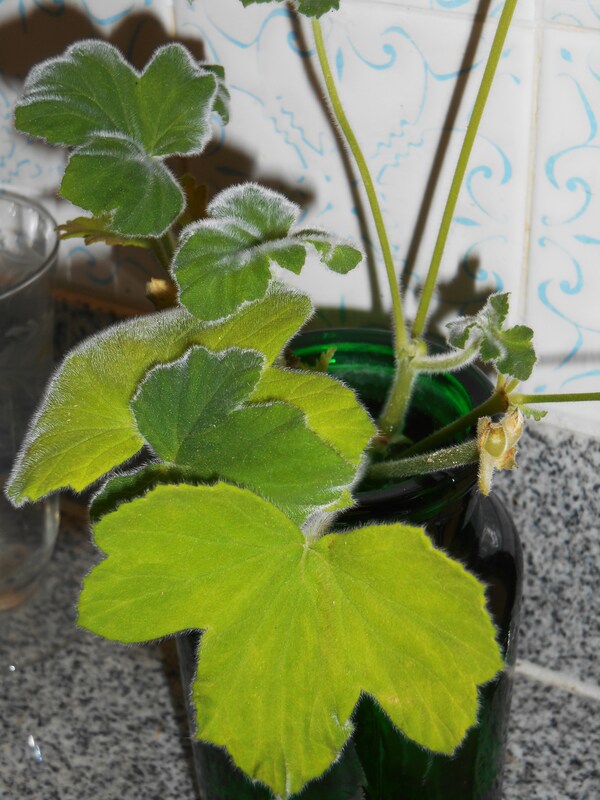 Its growth has been even more vigorous than its sibling grown in a pot. Both plants have grown taller than me, but neither has yet bloomed. I’m still hoping to see buds form and blooms open before frost. About three weeks ago I finally trimmed back the potted plant to encourage a bit more branching along the main stems, and plunked the two stems I pruned away into a vase of water by the kitchen sink. My friends know my kitchen sink, flanked by two windows, is my magical rooting spot in the house. One will always find stems of several somethings rooting in this bright, moist, protected spot where I can keep a close eye on their progress. And these tall stems of the African Rose Mallow did not disappoint. Although the stems were semi-hard when cut, the leaves have shown no signs of wilt throughout the process. I first noticed the new white roots on Sunday afternoon, and they have grown enough this week for me to pot the stems up today. 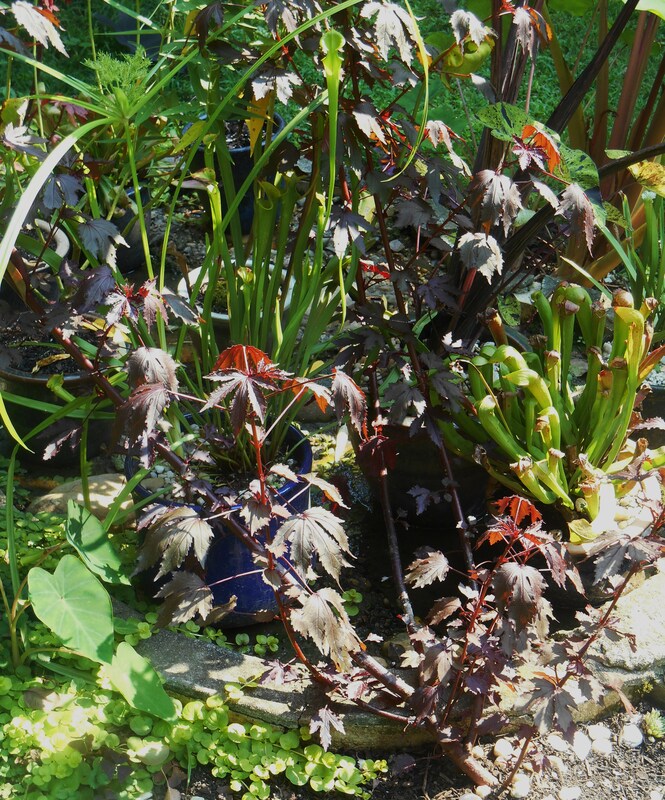 I’ve returned the rotted cuttings to the bog garden for now, but I’m considering where I would like to plant them out once their roots establish. It will definitely be somewhere it the front garden where I can enjoy them against the other Hibiscus which delight us all summer. The H. acetosella are rated as hardy in our Zone 7 climate. 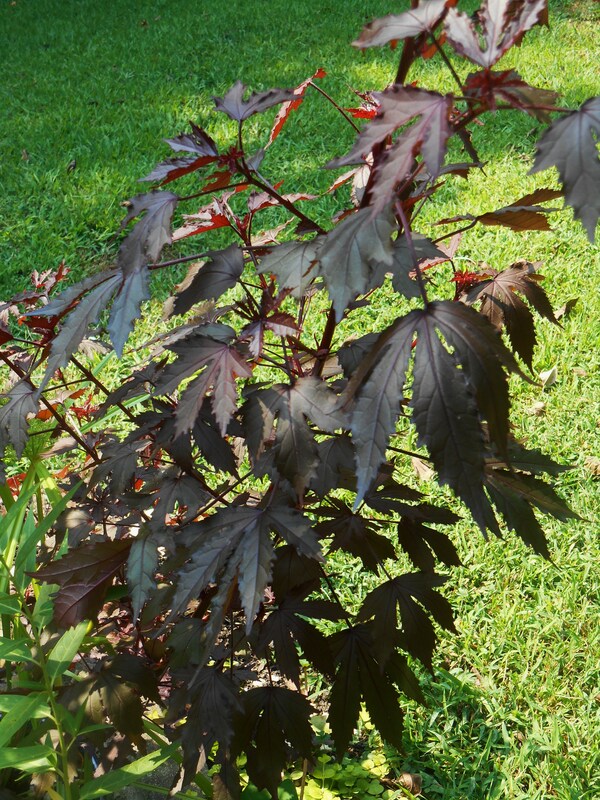 All of our native Hibiscus enjoy damp soils and are often found growing on river banks and near swamps. Yet, they make it in our drier garden just fine, with a little watering during dry spells. I’m planning to root another set of cuttings and produce a few more of these luscious rose colored Hibiscus plants. The leaves are edible, if one is hard pressed for a meal, and may be prepared like spinach. They retain their color when cooked. 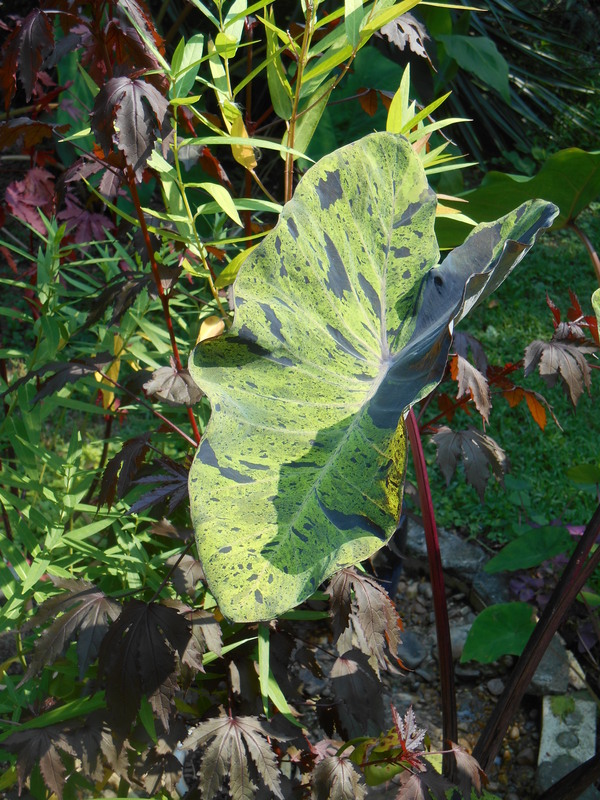 The leaves are also used as a medicinal herb in parts of Africa and South America. They have anti-inflammatory properties and may also be used to treat anemia. This is a good specimen for true forest food producing gardens, and I’m a little surprised to have not found it before this spring. If you enjoy hardy perennial Hibiscus and love plants with beautiful foliage, this African Rose Mallow may be to your liking, too. But you only need to buy one, and then take as many cuttings as you like to increase your collection. Our newly rooted cuttings, potted and returned to the bog garden to grow on for a few weeks before we plant them out into the garden. Early summer is the season when our new plant acquisitions sink their roots into the garden. This tiny cutting from an ornamental sweet potato vine grew roots as it sat in a little vase of water by my kitchen sink. Did you notice how the roots are curled into a spiral? 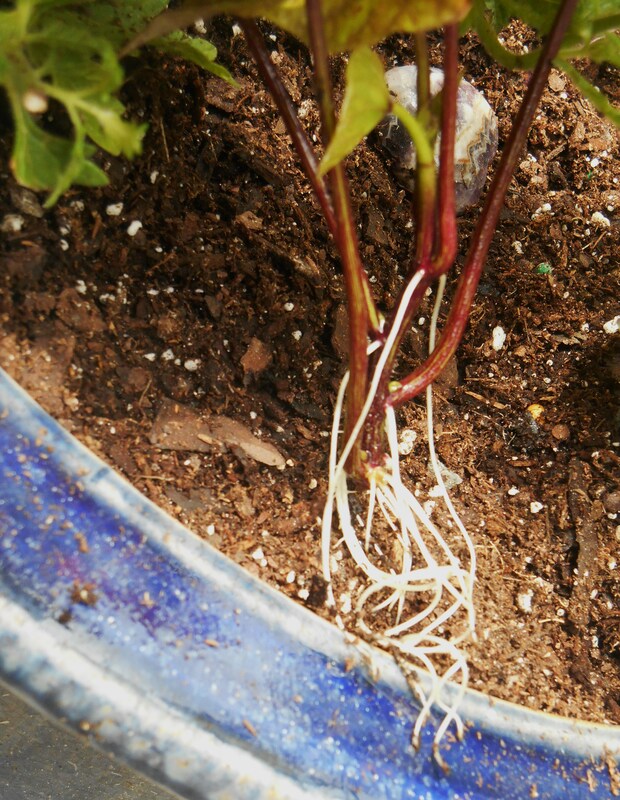 You may notice that roots grow in a circular pattern around the inside of a nursery pot, as well. When we knock a new plant out of its pot, we gently loosen these roots, growing round the outer edge of its root ball, to encourage them to grow out into the surrounding soil. The plant grows more vigorously when its root system expands. This tiny cutting grew these roots in a little less than two weeks. Once started, sweet potato, Ipomoea batatas, grows vigorously. A tender perennial, the vine will grow until frost kills it back. I enjoy ornamental sweet potato vines in summer pots, but have not grown any for the last several summers. They are very attractive to deer, and so must be kept out of their reach. They are also such vigorous growers that they can overwhelm other plants in a mixed planting. They are gluttonous for food and drink, and give their best color when grown in full sun. I’ve purchased two sweet potato vines of different cultivars this spring, however, and am taking cuttings to add to hanging baskets and planters on our deck. 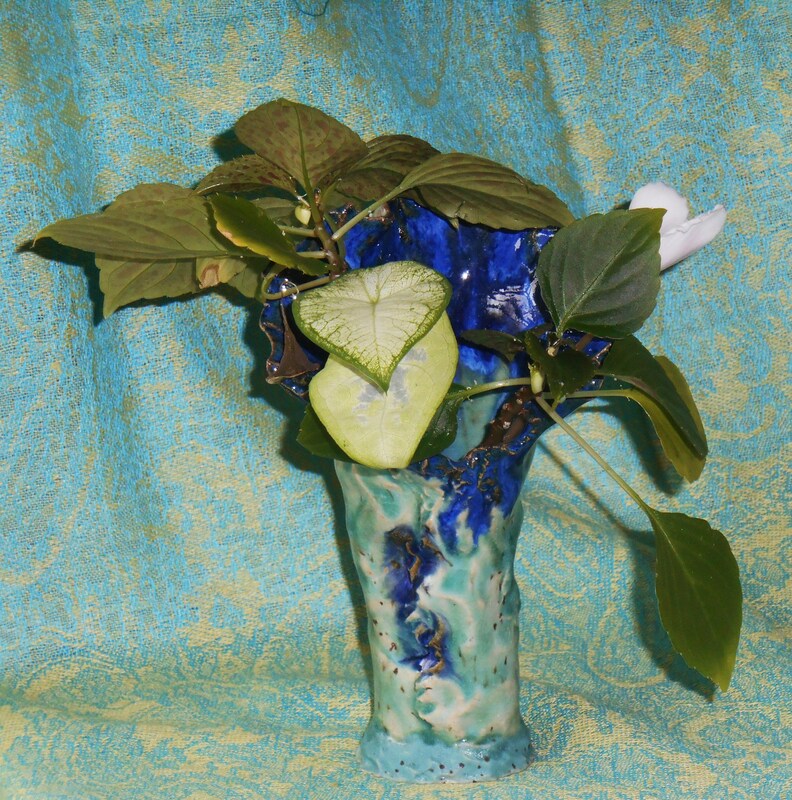 These vines create a lush, tropical look wherever they are used. 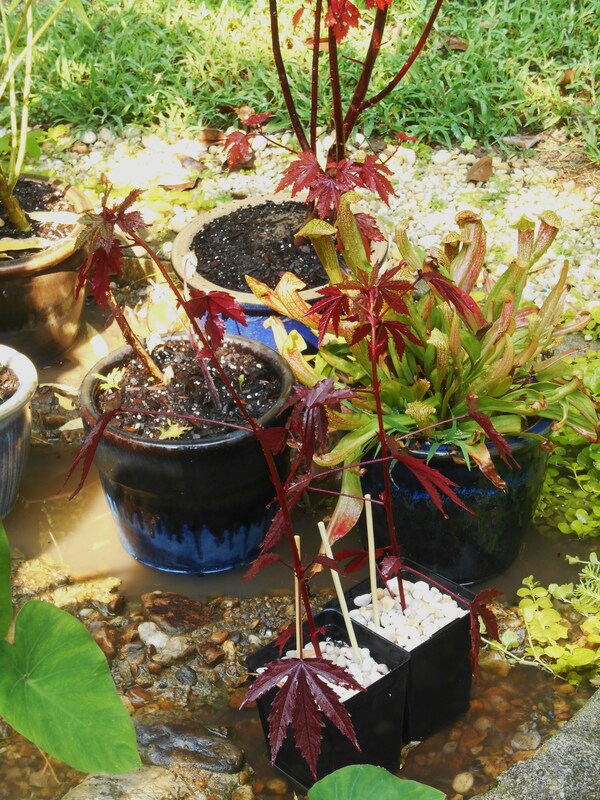 Many plants will root quickly in water during spring and early summer. This allows us to buy one established plant, and then quickly produce many clones of it. 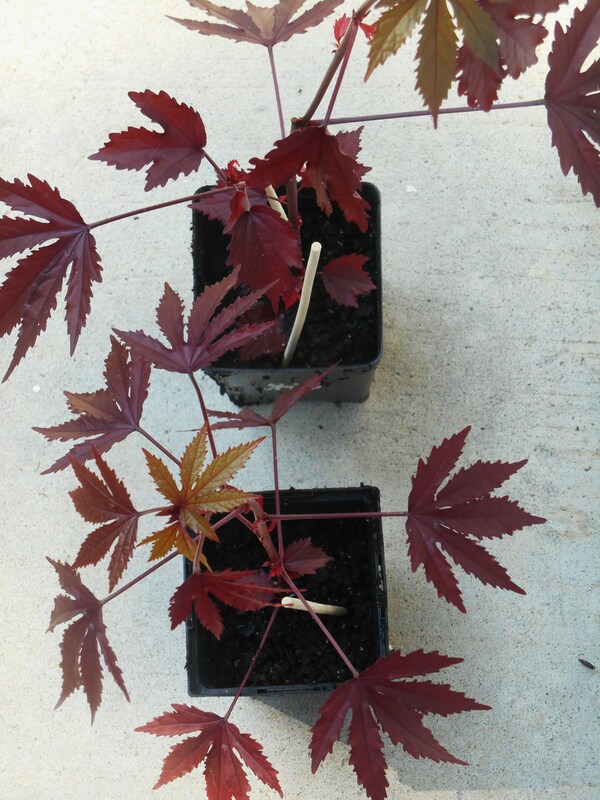 These new plants grow to a useable size more quickly from cuttings than from seed. As soon as they grow a few inches of roots they can be potted up or planted in the garden. A large number of plants of a single cultivar can be had in a matter of weeks for mass plantings, at minimal expense. These Coleus cuttings are rooting in their vase. They will be ready to plant out by early next week. One of my beloved blogging sisters, Eliza, sent me a package of scented Pelargonium cuttings this past week, and they are all happily gathered around my kitchen sink tonight engaged in the business of growing their roots. Half are in a jar of water, and the other half in a pot of damp sand. Pelargonium cuttings rooting in my favorite rooting jar. She prefers the damp sand method, and I am following her instructions to the letter. I am curious to see which method will prove more effective for rooting cuttings. Which cuttings will root soonest, and with the fewest cuttings lost to decay? This is Eliza’s preferred method for rooting cuttings. in clean, damp sand. I’ve kept these covered with a produce bag to increase the humidity around their leaves. The bamboo skewer holds the bag off of their leaves. A marvelous and generous gift, I am enjoying the fragrance of these beautiful cuttings, and can’t wait to watch them grow in our garden this summer. If you’ve not tried creating your own new plants in this way, this is a good time of the season to give it a try. It is an interesting way to generate a lot of free plants. 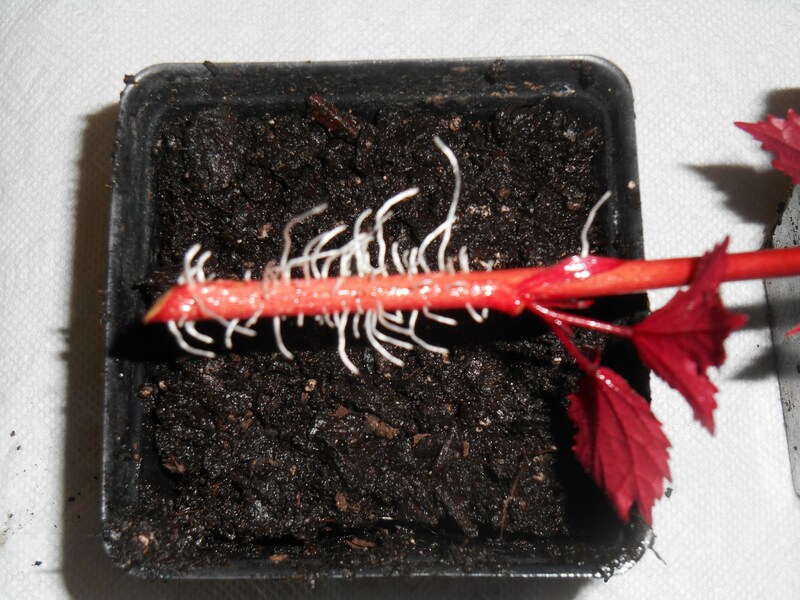 As you can see in the photos, roots will begin to grow both from the cut edge of a stem, and also from the nodes where leaves meet stem. Most gardeners will tell you to remove all leave which would be underwater. That is good advice, and I don’t often follow it. The idea is that if those leaves rot, the water is contaminated and you might lose the whole cutting. 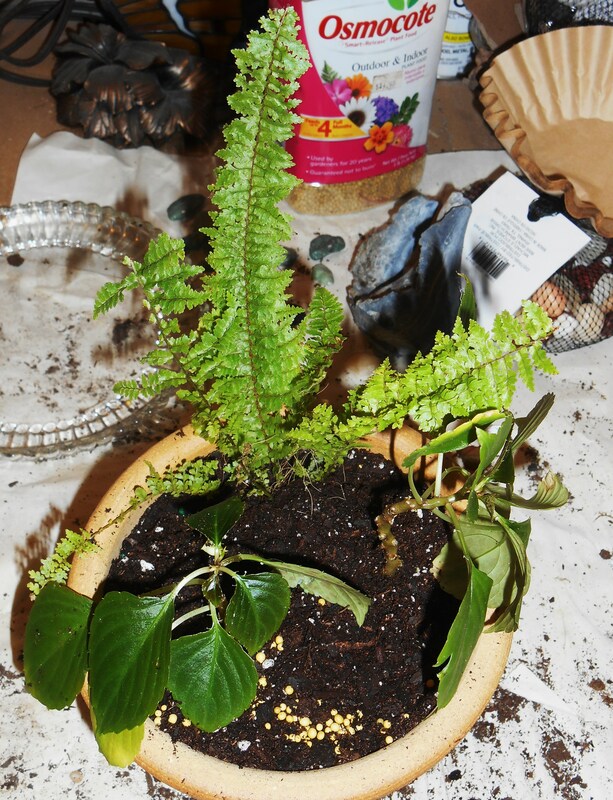 As you can see here, the leaves are still just fine, and I have a well-rooted cutting to plant in this mixed pot. ‘Carzytunia Sparky’ Petunia; Strawberry and Cream Lanai Verbena; the newly rooted sweet potato cutting; and a volunteer seedling of ornamental pepper moved over from another pot. We’ve had a lot of rain today, so it has proven a good day to pot up cuttings. I am looking forward to seeing this pot fill in with lots of lush color and interesting form this summer. 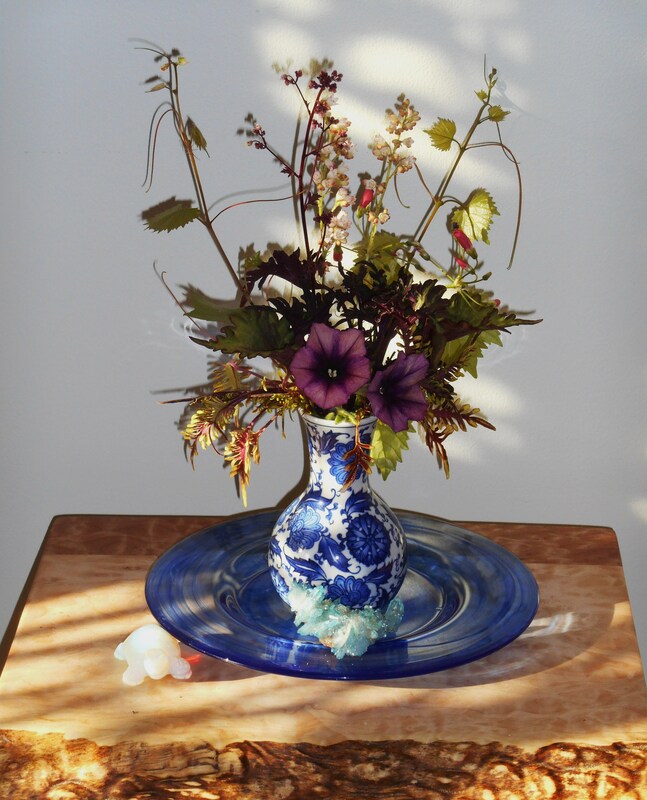 The flowers and foliage in today’s vase were clipped late this afternoon; mostly from pots on the deck. So many stems cut for the Monday vases this spring rooted in place, that I chose this particular combination with that intention in mind. 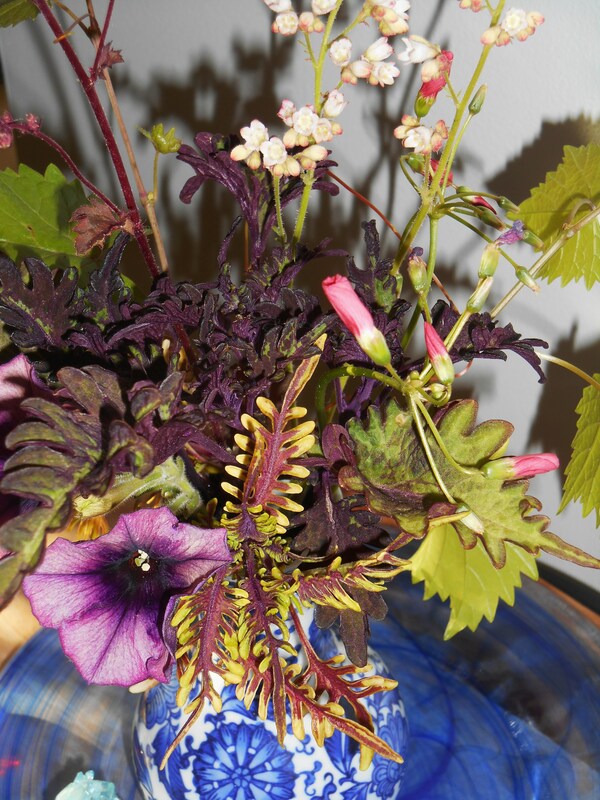 These Coleus, from the “Under the Sea” collection, were clipped from the nursery pots I bought them in on Saturday. I took cuttings immediately to leave with my father, another Coleus devote’, and now I’ve snipped a little more for cuttings of my own. 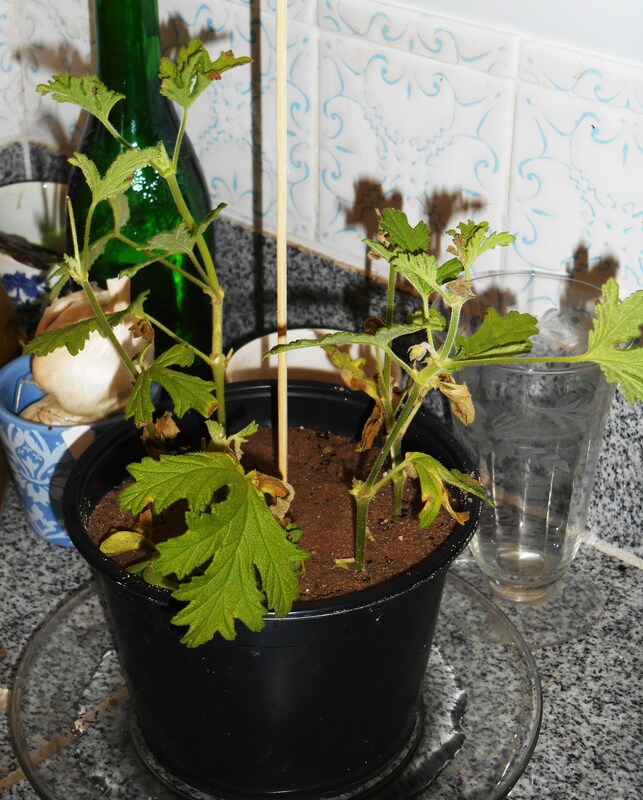 The original plants will remain in their pots for another day at least. 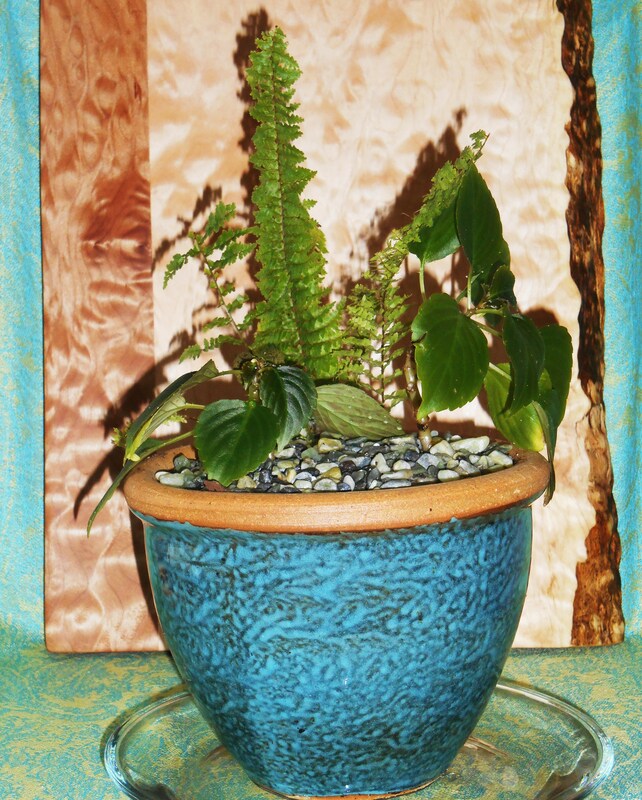 Coleus root quickly and easily in water. My father simply breaks stems from a growing plant and pushes the stem into the soil in another pot. He has great success, but I am not quite that self-confident. I enjoy watching the little white roots form in a vase by the kitchen window before tucking the well rooted little cutting into some soil. I’ve managed to collect three of the “Under the Sea” cultivars this spring. So far I have C. “Lime Shrimp,” C. “Bonefish,” and C. “Gold Anemone.” These are some of the most delicate and unusual forms of Coleus I’ve ever found, and I like them alone or in combination with annual flowers. Have you found these at your garden center? The “Under the Sea” Coleus is easy to grow. It tolerates more sun than some older cultivars of Coleus, and can grow into a good sized plant over the season. With the Coleus is a cutting of a dusky purple Petunia I’m growing in baskets this summer. I like this unusual color, which was the closest I could find to the wonderful gold and purple striped Petunias I grew in baskets last summer. Sadly, the plants didn’t make it through the winter. I hope this Petunia will root, as we enjoy it in the vase. 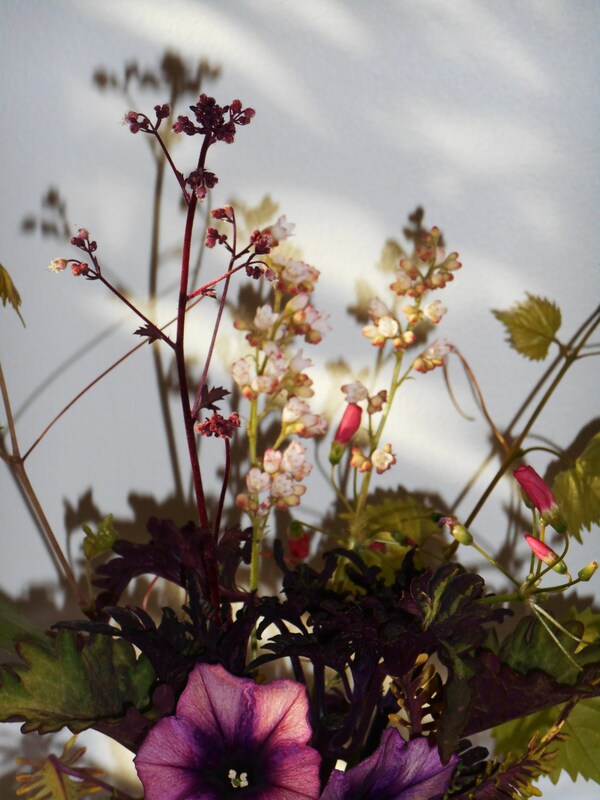 Our Heuchera, or Coral Bells, have bloomed in pots on the deck. I grow them for their unusual leaves, and these delicate stems of flowers are a bonus from time to time. 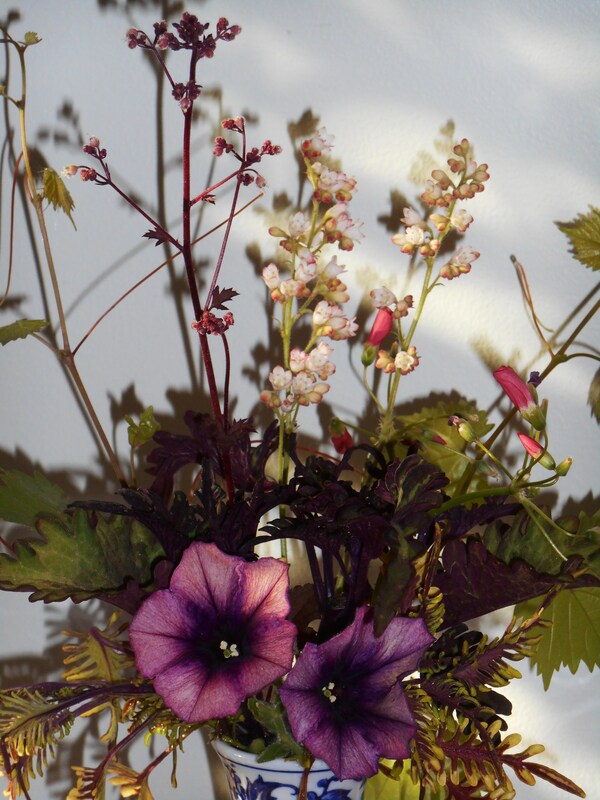 The other stems of flowers were cut from Oxalis. Finally, I had to add a few little pieces of our Muscadine grape vines, which are such a beautiful shade of green when young and tender. It is highly unlikely these will root, but I have a place ready for them if they do. One of the vines I transplanted in early spring has not leafed out, and I cut it back today. Our mineral today is a cluster of Aqua Aura quartz. 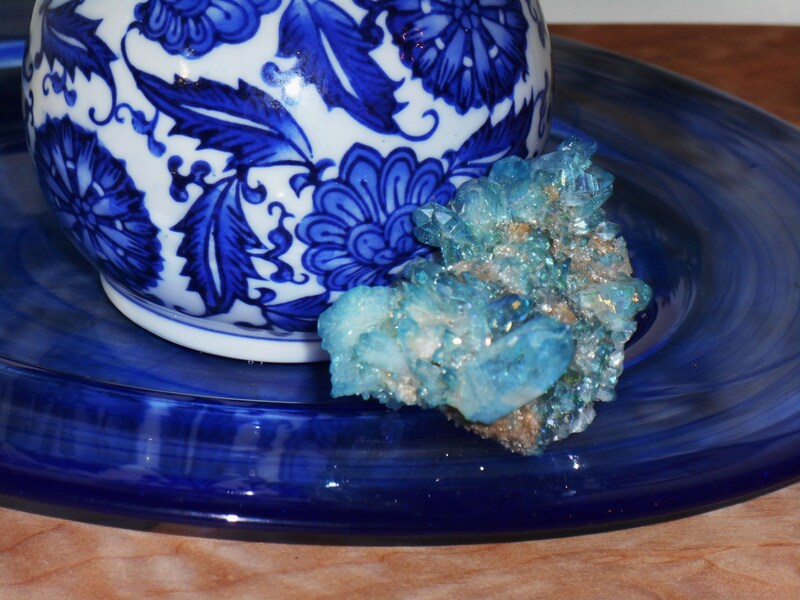 This is actually clear quartz, which was specially treated to create this unusual blue color. Our little moonstone turtle sits with the vase, also, as a reminder of the turtle eggs incubating now in our garden. This is the season when there is always more to do in the garden. We’ve both been spending our mornings, into the early afternoon, working outside. We love this time of year, when the garden is growing so rapidly, but it takes enormous time and energy to keep up with it all. I stayed a bit too long today out in the hot sun, and so wanted something cool and delicate in our vase indoors. Please remember to visit Cathy, at Rambling in the Garden, who sponsors “In A Vase On Monday” each week. I appreciate her tireless inspiration to cut and arrange home grown flowers, and to encourage other garden bloggers to do the same. 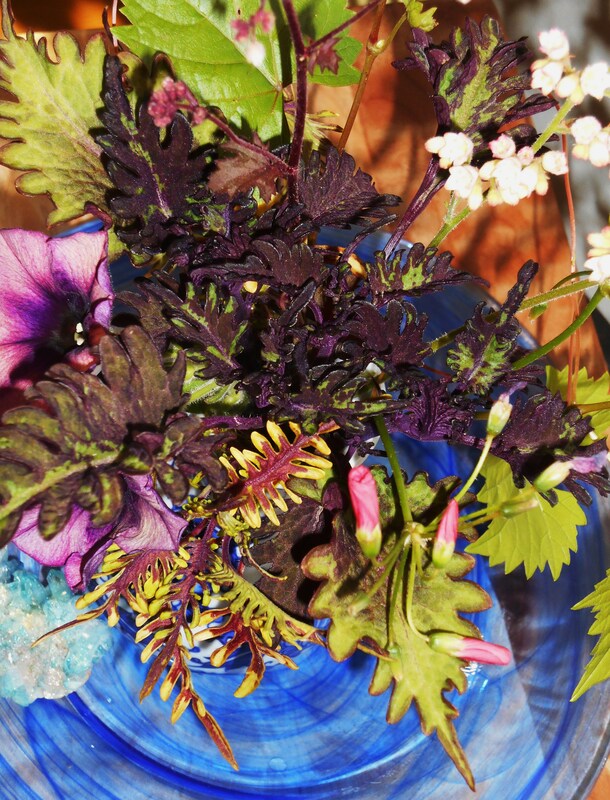 This week she has created a stunning arrangement she calls, “Storm in a Teacup.” You’ll find many links to other gardeners’ blogs in her comments. 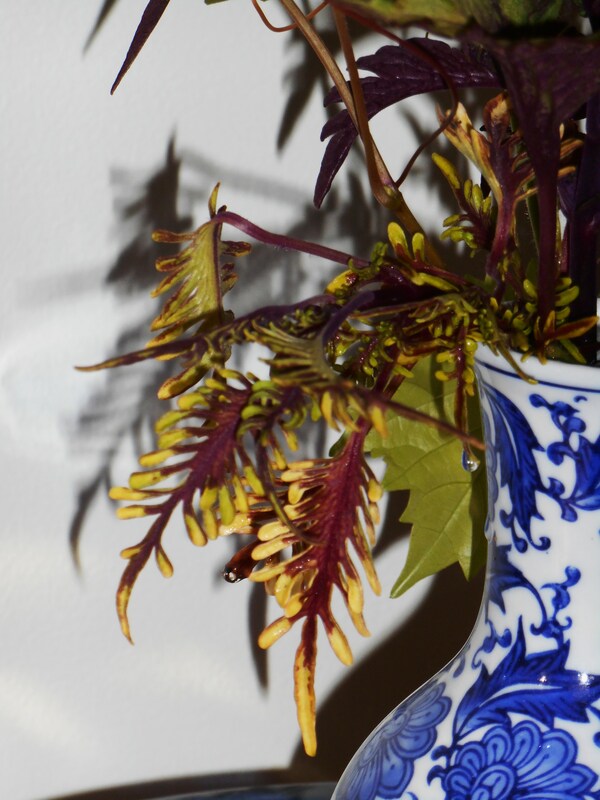 And remember, you can enjoy beautiful foliage in your vase while it roots. Just as our gardens find their structure in foliage and accents in flowers; so our arrangements may, as well. We enjoy both the pleasure of its beauty and the gift of a new plant when we eventually take it all apart. It is sort of like eating your cake, and having it, too . An annual Impatiens plant lives on through winter in a pot in our living room. 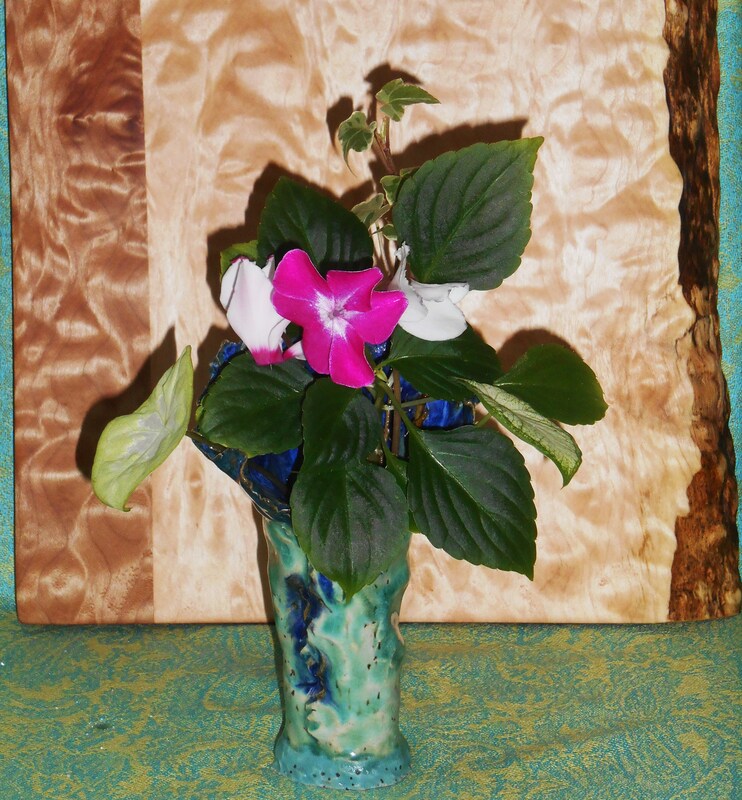 When it bloomed again in February, I cut stems for my In A Vase on Monday post on a cold and snowy Monday. Although the flowers faded, both stems rooted. In fact, they have grown huge root systems in just a few weeks. This is such a beautiful affirmation of spring stirring in the plants! Since teal is on my mind this week, I found a beautiful teal pot for the rooted stems, and potted them up with a division of lady fern. They can grow on together in the pot until it is warm enough to move them outside into a hanging basket or a larger pot. Impatiens bloom non-stop all summer long. They love moist fertile soil in partial shade. They will grow to nearly two feet high if planted in good, rich soil. They are heavy feeders and appreciate good soil and regular feeding. A single plant will fill a hanging basket. Impatiens are so easily rooted in water that I often buy a hanging basket of double impatiens when they first appear in the spring, then take lots of cuttings while also cutting that plant back. 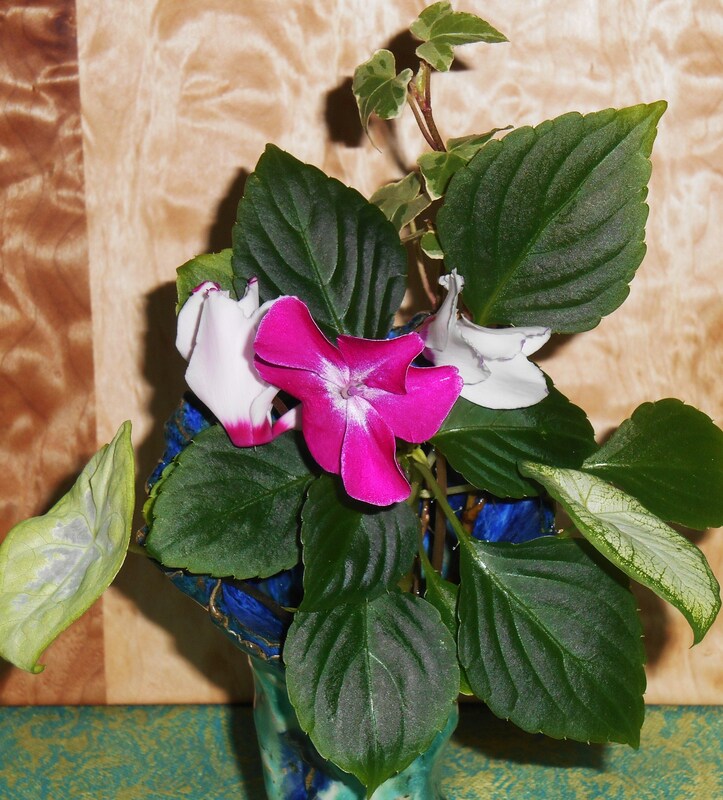 The original plant grows back bushier and stronger, with more blooms. The cuttings can soon be planted out as independent plants to enjoy all summer. This is a neat trick when you need a lot of the same cultivar of impatiens for a large planting. Our over-wintered plant has long, winter stretched stems, as you might expect. It needs a good trim before growing on this summer. So I’m helping it along by cutting another stem for the vase. At this rate, I can fill the vase indefinitely. Would you call this re-cycling? I think it is a beautiful way to get us through this next bout of wintery weather and continue preparations for spring! Do you like miniature gardens and “little worlds”? I downloaded samples of several books about miniature gardens, fairy gardens, and terrariums on Saturday looking for inspiration and fresh ideas. 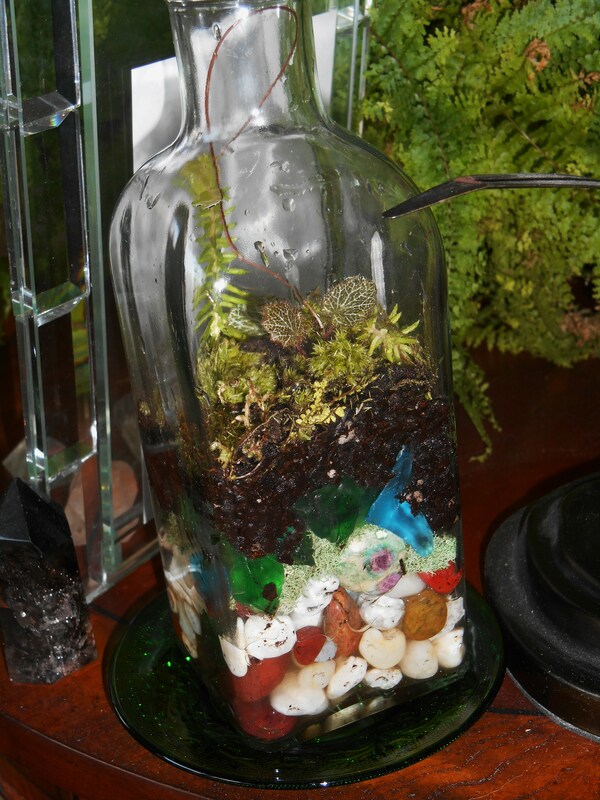 Terrariums and fairy gardens first caught my imagination in childhood. I love that terrariums are largely closed ecological systems, mimicking the water cycle of our planet where water evaporates, condenses, and then returns to the soil. 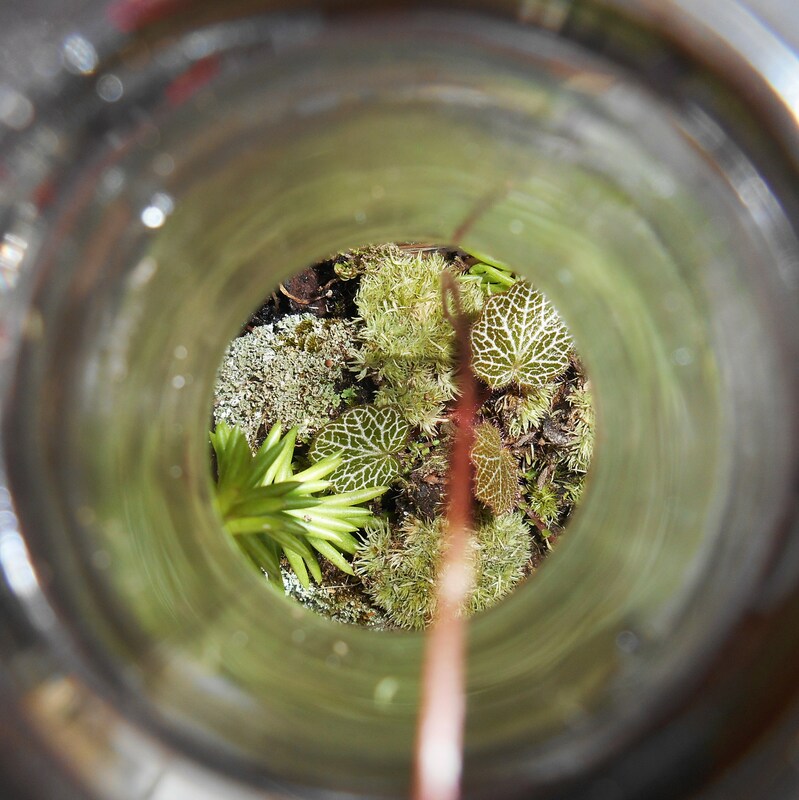 Once constructed, a balanced terrarium can live indefinitely; or at least until the plants outgrow their vessel. These are great little gardens for those with little space, or for those who want to bring a bit of nature into their professional environment. 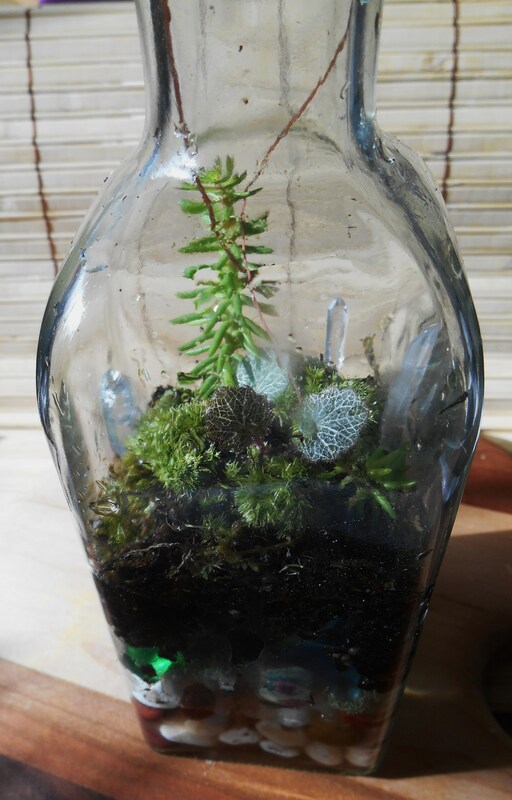 There isn’t any anxiety over keeping them properly watered or making a mess, with a little garden in a bottle. Divisions used in this little garden include a golden creeping Sedum and a division of peacock spikemoss. I broke these off of pots I’m overwintering in the garage. This olive oil bottle came from Trader Joe’s. It needs a bit more scrubbing to get the rest of that glue off! My bottle came full of olive oil from Trader Joes. The olive oil was delicious, by the way, and I just saved the bottle in the pantry because it was too pretty to throw away. Agates from Oregon beaches have a new home now in the terrarium. They’re prettiest when wet, anyway. The scarf is one I just finished for a friend. 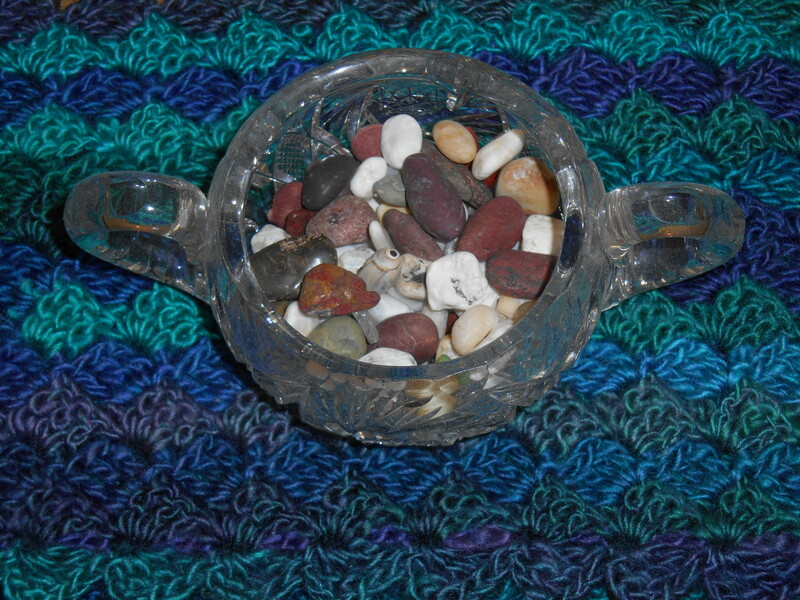 The stones are mostly agates picked up off beaches in Oregon. There is a layer of reindeer moss from the craft store, left over from my moss-covered wreathes, and then another layer of glass shards from a bag of assorted glass purchased at the crafts store for other projects. New potting soil and bits of plant materials from the garden complete the project. My only new investment here was a bit of time on Sunday afternoon. All terrariums need an inch or so of loose stones as their base layer. Not only are they pretty and interesting to view from the glass, but they form the drainage system of the environment. 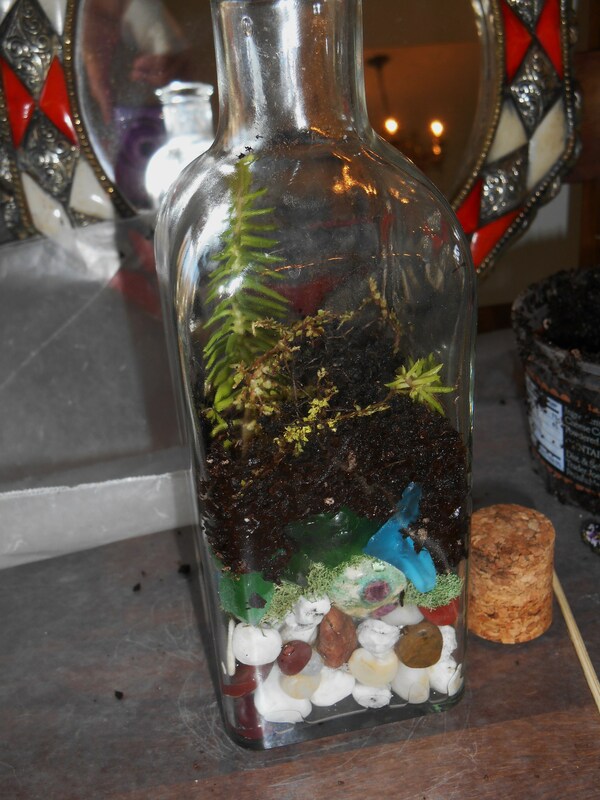 Any water you add to the terrarium, which isn’t absorbed, drains down into the stones so the soil isn’t waterlogged. The layer of moss between the stones and the soil serves as a barrier to the soil to keep it from running down into the stones. It is purely aesthetic. I added bits of “beach glass” around this moss layer to add to that barrier, as well as for the color. Now, there are easier ways to do most anything. Hold the bottle at an angle when adding the stones and glass, to direct where they fall. I added a few stones to the center of my pile to take up space, allowing more of the agates to be visible against the glass. Tilt the bottle when dropping in bits of beach glass to direct where you want the glass to land, then nudge it into place with a long, narrow tool. 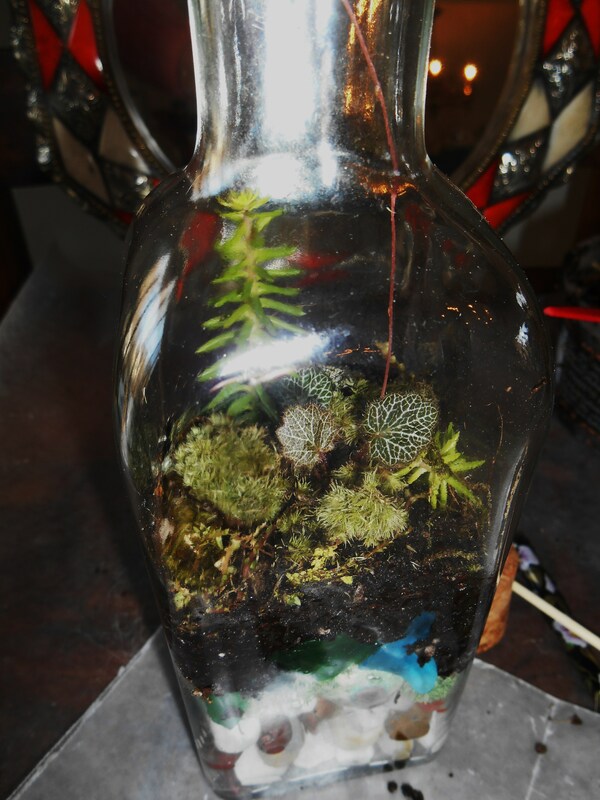 Use whatever you have on hand to work inside the terrarium. Many builders suggest chopsticks. The cheap ones which come with your meal are the best. I also like bamboo food skewers, and always have a pack lying around. Even a pencil works just fine to nudge things into place through the narrow opening of the jar. The depth of soil needed depends entirely on plant choice. Ferns and sedums need a little soil. Moss needs very little. I’ve used just over an inch of soil. The roots will also grow down through the reindeer moss and into the stones below to reach the water there, eventually. 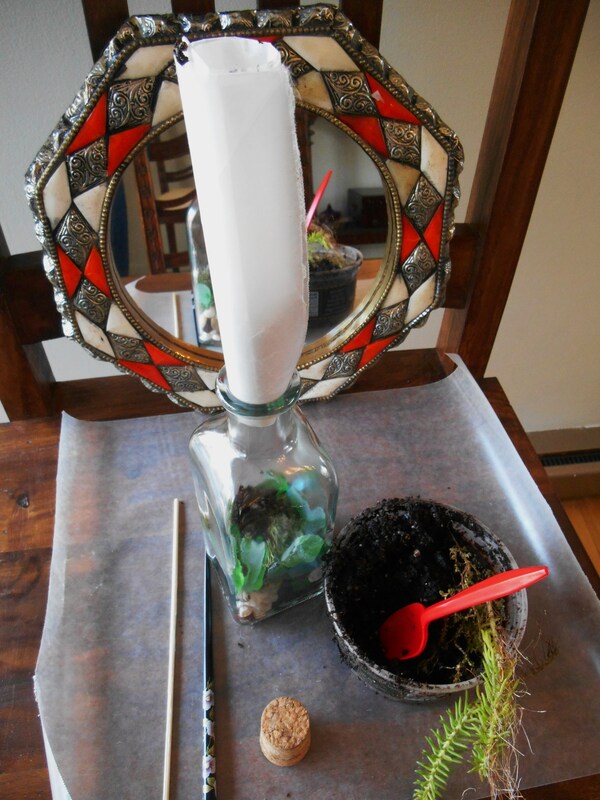 A piece of paper, rolled into a funnel, is all you need to get soil or sand into your terrarium neatly. Just spoon it through the opening, and nudge it into place with your long skinny tool. Plants can be dropped through the opening, or gently rolled up into a piece of paper and then slid through the opening, before being nudged into place. These tiny plants have tiny roots. 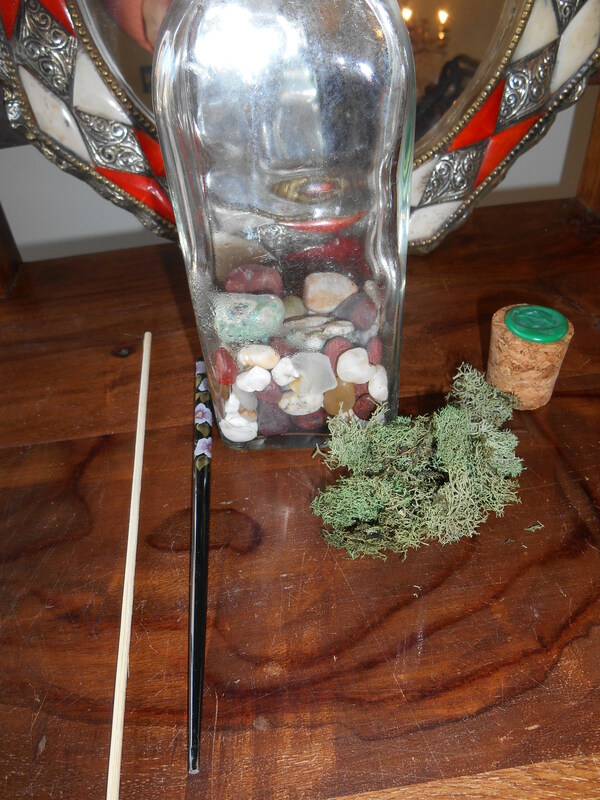 It is fairly easy to work soil around the roots , pushing everything into place with your chopstick or pencil. I finished off by covering the soil with bits of garden moss. Everything was frozen solid here on Saturday. These bits were actually pried out of a pot on the deck, where I’ve been holding them since November. The secret to making an interesting miniature garden lies in beginning with tiny starts of things, and then allowing time for them to grow. 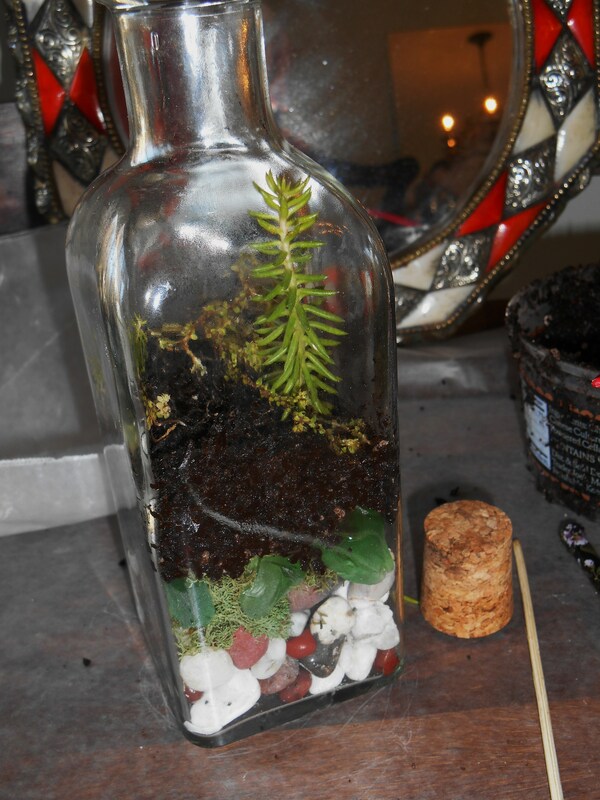 For example, you might plant a seed or a bulb, so long as the plant itself will fit in the space the terrarium allows. 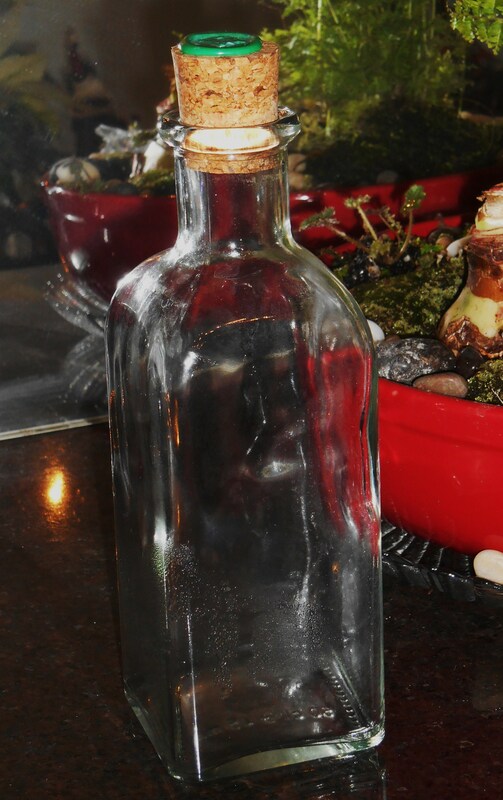 Can you see a tiny crocus growing inside this bottle, from a bulb planted in the fall? It would be a very temporary display, but very cool. I’ve used another tiny division of peacock spikemoss, Selaginella uncinata, which can grow quite large, on one side of the bottle; and a tiny baby strawberry begonia, Saxifraga stolonifera, still attached to its umbilical stem, right in the middle. 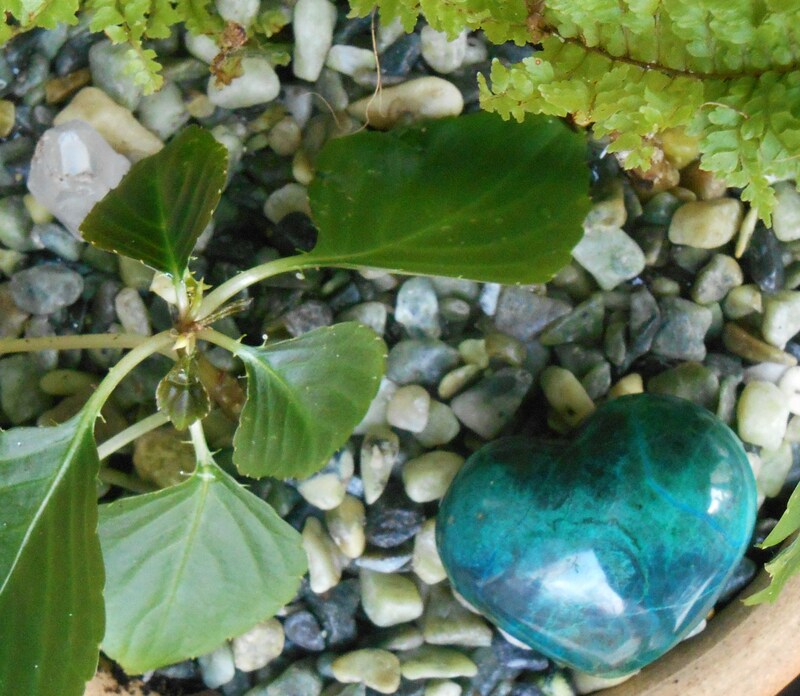 My strawberry begonia plants, growing inside this winter, are making new baby plants every week! I simply lowered this one, by its stem, into place where I want it to grow. Its roots will take hold now in the soil, and quickly anchor it into place. 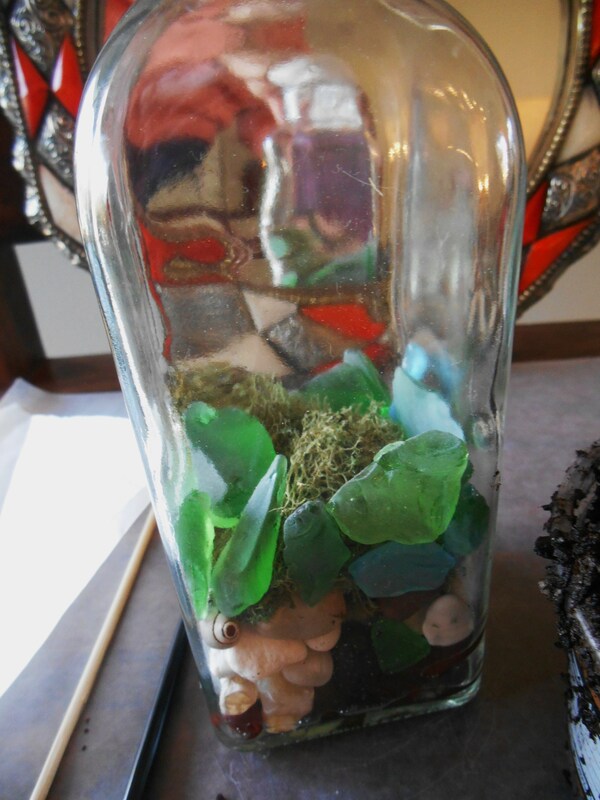 Once planted, add little stones, crystals, shells, marbles, bits of glass, or other ornaments to suit your vision. Add tiny furniture for a fairy garden. Lay stone paths or patios. Add a statue if you wish. This is your garden and you can do as you please! The final step of construction is watering. I prefer to use bottled spring water so no chemicals are introduced, which might affect the growth of the plants. And one must water very sparingly. Little drops at a time are used to rinse away any specks of soil on the glass and to settle the roots into their new soil. I left this bottle open for the first 36 hours to allow for some evaporation. An opening this small could be left open all of the time. But by replacing the stopper, this little garden won’t need additional water for months. If the glass fogs up, I can remove the stopper for a few hours to allow the water to clear. If the soil begins to look dry, a few drops of added water will solve the problem. 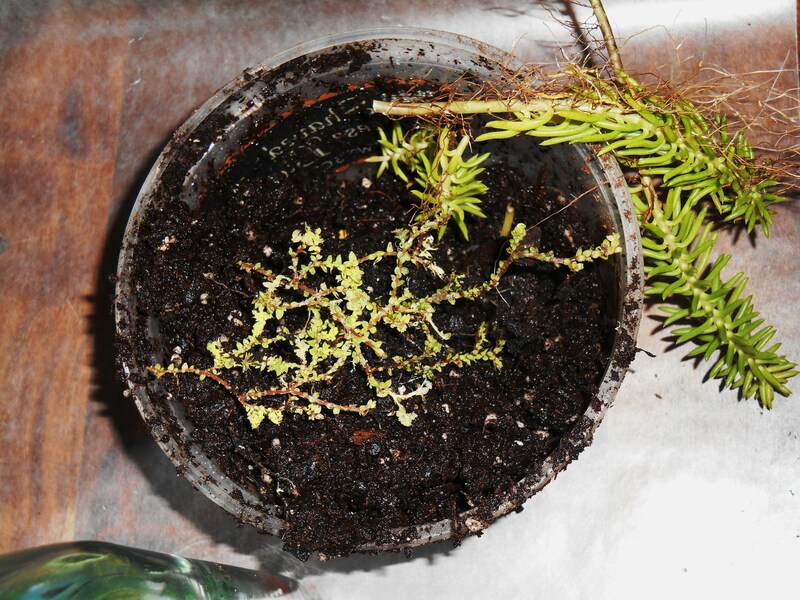 That is really all you need to know to now build your own terrarium. 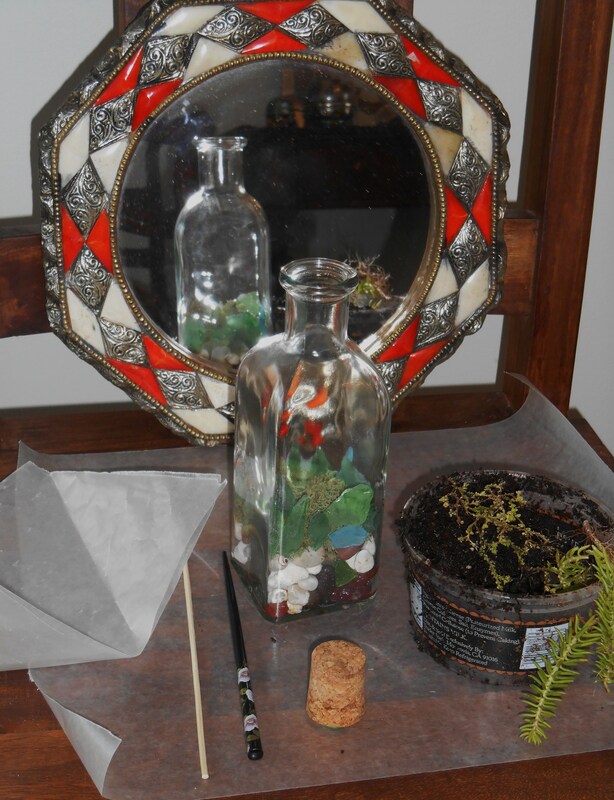 Place your finished terrarium in bright light, but not right against a window. This one sits opposite the doors to our deck. When choosing plants, select those which enjoy high humidity and which can grow without overwhelming the interior space of your garden. 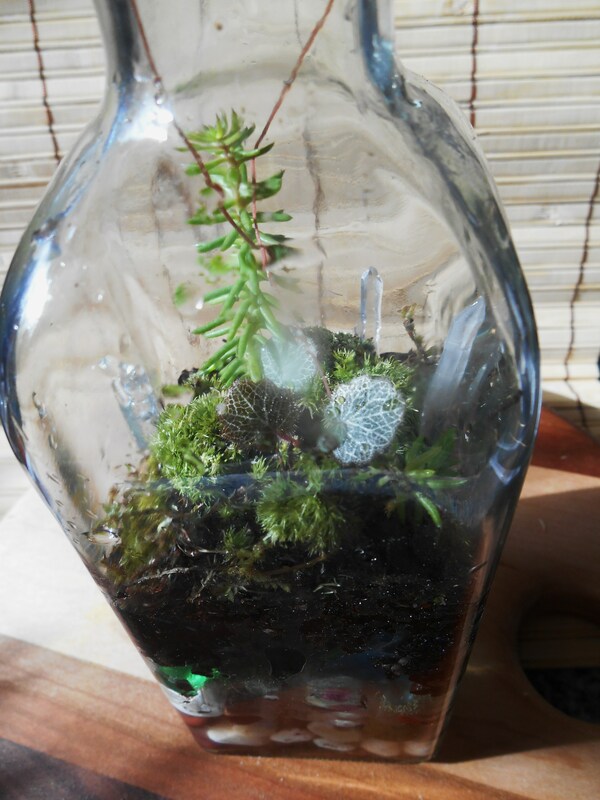 Terrariums can be built to accommodate succulents. These need openings for air circulation, and should be started off with even less water. Air plants, which don’t require soil, make excellent terrarium specimens. But these should be placed on wood or gravel, since contact with potting soil may lead them to rot. The possibilities are limited mainly by your imagination and the depth of your purse! Following are the books I reviewed this weekend.